Evonik, the creative industrial group from Germany, is one of the world leaders in specialty chemicals. As a technology leader for PMMA molding compounds with decades of experience, we supply specialty acrylic compounds to the medical device sector. Our resins are used in a wide range of applications, including medical devices, medical diagnostics and medical packaging. Evonik’s high quality standards and wide range of innovative acrylic products help our customers improve their product performance and grow their sales. CYROLITE® compounds (G-20, G-20 HIFLO®, GS-90, CG-97, Med 2 and Protect) offer the very best balance of properties for MedicalDevice Applications. All grades of CYROLITE® compounds are engineered for applications where gamma or e-beam sterilization is required, with no loss in properties. CYROLITE® compounds can withstand the rigors of EtO sterilization protocols. CYROLITE® compounds are easy to process and can be used for very intricate to very large medical device parts. All grades are tough, transparent, bondable and chemical resistant. 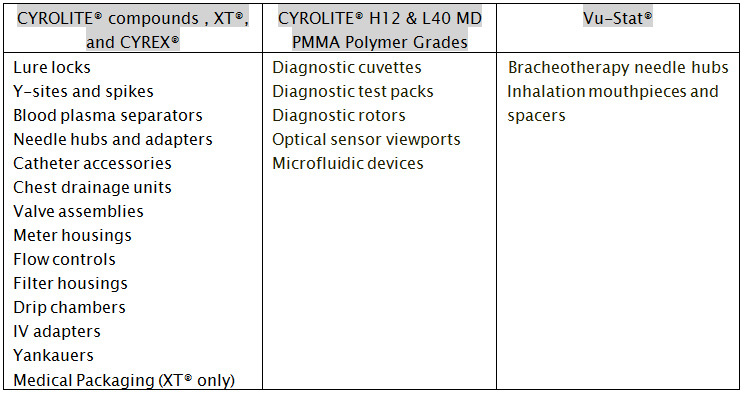 CYROLITE® Protect – CYROLITE® grades with antimicrobial properties intended for use with FDA – regulated Class I and Class II medical devices covered by 510(k) PMN submission. XT® polymer has a long history on use in medical device packaging. Cost effective – its rigidity allows for down gaging sheet thickness to save cost. Sterilizable – compatible with EtO, gamma* and Ebeam*. No silicone contamination worries since it denests easily with the need for silicone denesting agents. CYREX 200-8005 acrylic-polycarbonate alloy, an advanced alloy, is formulated specifically for the medical industry. Unique combination of properties that will enhance the performance of devices that are opaque. Is chemically resistant to both alcohol and lipids. It is EtO, e-beam and gamma sterilizable, and easy to process. Can be processed at lower temperatures than-polycarbonate material, decreasing the cooling time which decreases the cycle time of an injection molding process. CYREX® Protect – CYREX® grade with antimicrobial properties intended for use with FDA – regulated Class I and Class II medical devices covered by 510(k) PMN submission. Vu-Stat™ static dissipative acrylic multipolymer compounds are transparent, electro-static dissipative compounds that have outstanding ESD properties and an excellent balance of mechanical, thermal and flow properties. Vu-Stat compounds provide permanent ESD protection for parts that are sensitive to static discharge. Vu-Stat compounds for medical device applications requiring a transparent, tough, anti-static compound. 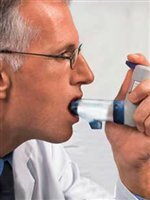 Applications involve inhalation drug delivery where a static-free mouthpiece and spacer mean more of the drug is delivered to the patient. In bracheotherapy applications, a static-free needle hub environment makes delivery of radioactive materials to the patient much easier. Vu-Stat compounds are inherently anti-static and do not depend on relative humidity to deliver static-free results. The material retains permanent static dissipative properties even after many washings.